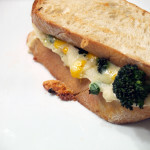 Over the past week, I had been planning to make a brand new grilled cheese featuring homemade cauliflower puree. However, there was always something that stopped me. Not enough time, too many errands, etc. It all changed on Saturday when us here in Cleveland were snowed in. With whiteout conditions, I obviously wasn’t going anywhere, but that didn’t mean ingredients weren’t coming to me. Sitting outside our garage on Saturday was a box of various cheeses courtesy of Cabot Cheese. (I am now a member of Cabot’s Cheese Board. Go me.) 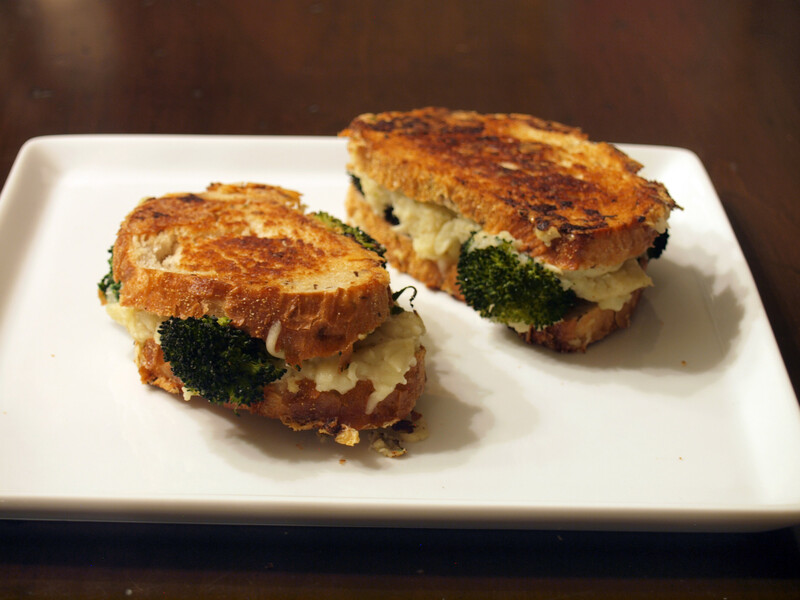 I had already purchased my previous ingredients, broccoli, cauliflower and rye bread, so I was all set to create a brand new grilled cheese creation. When a box of free cheese lands on your doorstep during a snow storm, how do you not make a grilled cheese? It was kismet, a match made in heaven. With 4 cheeses to choose from (image below), sharp cheddar, light cheddar, pepper jack and horseradish, I had a decision to make. I had already made a pepper jack grilled cheese last week so the pepper jack was out. I am not one to use light cheese when I have other options so that was out. We earnestly tried to use real horseradish in our Cheddar, but over time, real horseradish negatively impacted the integrity of our cheese. The flavor used in our Horseradish Cheddar is an all-natural combination of oils, mustard, and other spices, which we add to our natural Cabot cheese. After all that my choice was made for me: Cabot Seriously Sharp Cheddar. It was an amazing cheese at that. Yes, this cheese was sent to me at no charge. But trust me when I say, this cheese is most definitely “seriously sharp.” For some reason, upon first bite, I tasted Swiss. (Yes, I am odd.) On subsequent bites, that is when I tasted the true bite of the Sharp Cheddar mixed with a delicious creaminess. I love Cheddar cheese, but only when they are sharp, and Cabot’s version did not disappoint in the least. I would highly recommend Cabot Seriously Sharp Cheddar to all. Even if you have to pay for it. 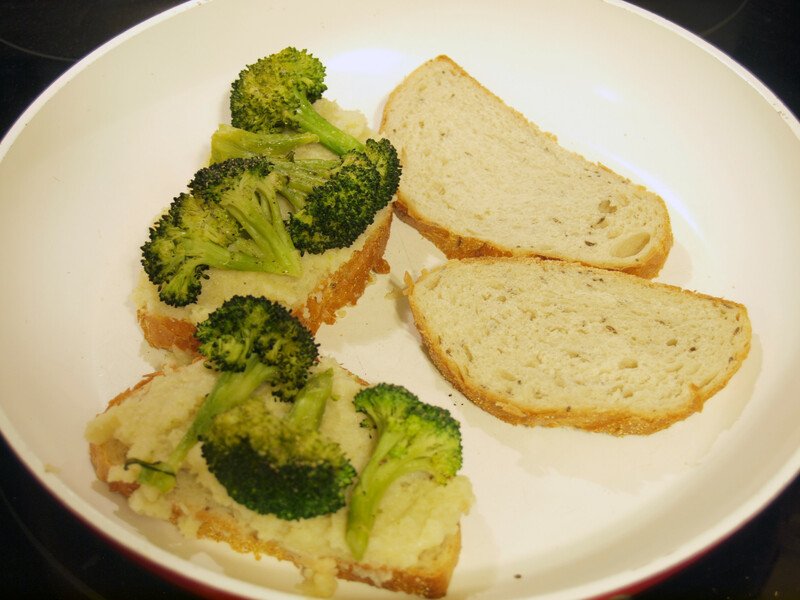 I have made a grilled cheese featuring broccoli and cauliflower previously and while it wasn’t bad, it was not exactly what I expected. The mixture was more on the mild side and lacking in true flavor. It was not what I was hoping for. 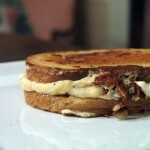 With this grilled cheese, I set out to make a better and more tasty version of the original. I started by creating, for the first time, cauliflower puree. This mixture seems to be the ingredient everyone is talking about when trying to create a healthy diet. 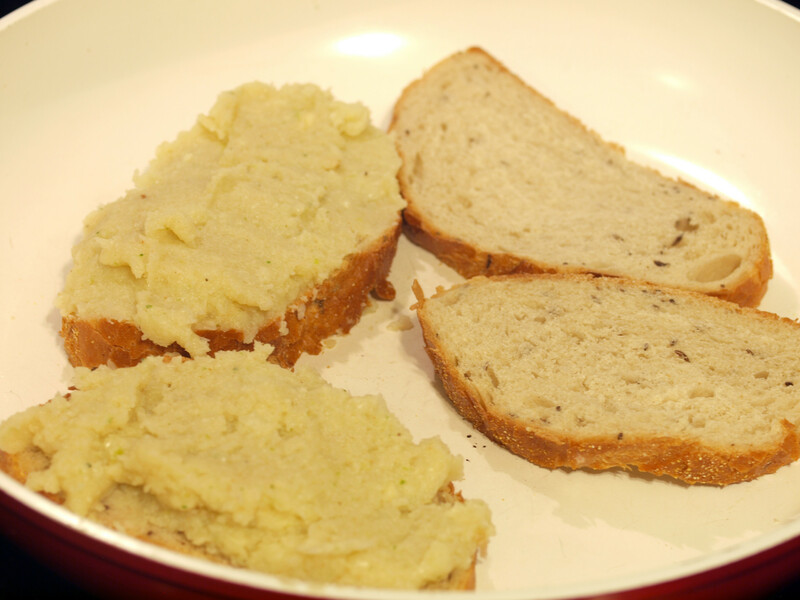 Cauliflower puree instead of mashed potatoes. Cauliflower puree pizza crust. So many options. 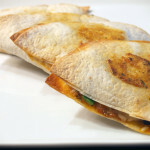 Google was awash with so many recipes that I took inspiration from a few different options that you should look through (1, 2, 3, 4). Using a steamer that the sous chef seemed to just have lying around, I steamed both the cauliflower and broccoli for 10 minutes or so just to get them soft to the touch. 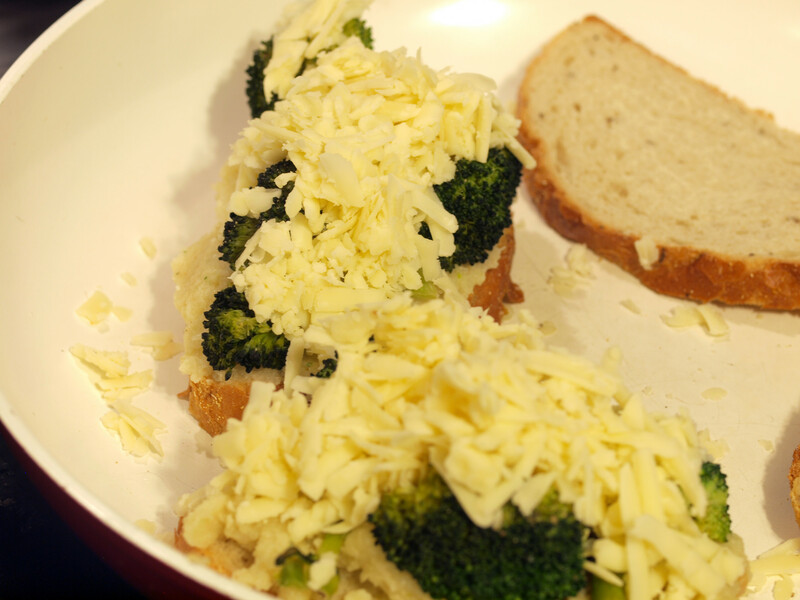 Then, I separated the broccoli and cauliflower. Set aside the steaming liquid. Now this is where I used a little bit of liberty with the few recipes I found online. Most of them said to use some sort of liquid such as heavy cream, buttermilk or just plain milk. However, I didn’t have heavy cream or buttermilk and was unsure about using milk. I had some egg nog that I could have used but I still wasn’t sure. I decided to use some of the steaming liquid simply because it smelled delicious. In addition to the liquid, I added some butter, garlic (probably way too much but more on that at the end), fresh chili powder and salt and pepper. Of course, the ingredients included are all personal preference. I just happened to have (and love) fresh chili powder so that is why I added it. If you would prefer something more mild, leave it and the garlic out. Have fun with your cauliflower puree and I have no doubt it will be delicious. Mix this with just a hand blender and you will be all set. I added the steaming liquid slowly as I was blending, using only enough to help with the blending process. I didn’t want the cauliflower puree too runny in my sandwich. Once I tasted the cauliflower puree, I truly realized how much the puree resembled mashed potatoes. 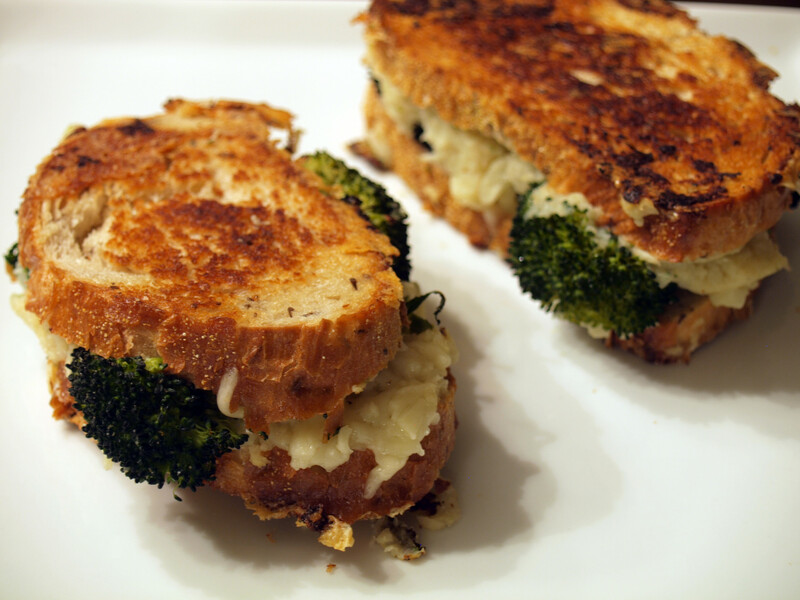 And how much this grilled cheese resembles another favorite sandwich of mine, Garlic & Green Onion Mashed Potato Grilled Cheese. This won’t be the last time I make cauliflower puree. 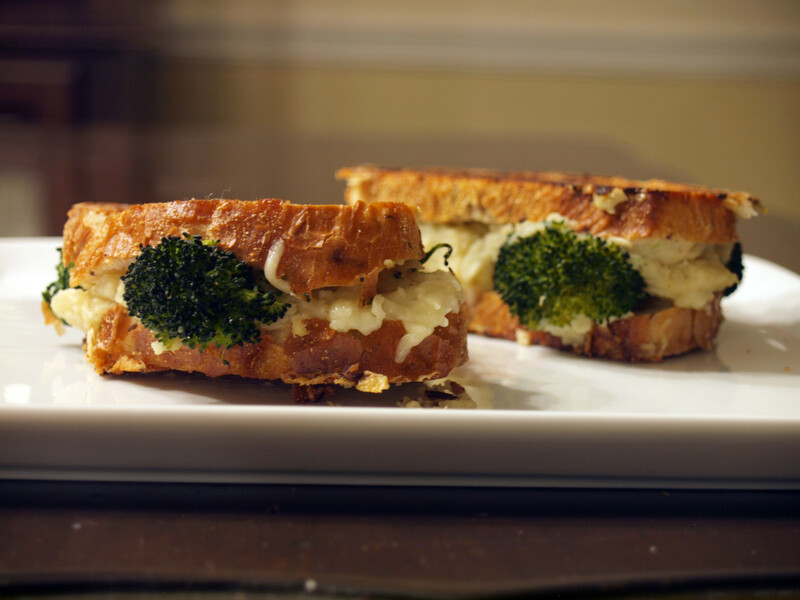 I probably could have included the broccoli in the cauliflower puree but since that is what I did in my previous attempt at this sandwich, I wanted to switch it up just a little. Instead, after steaming the broccoli with the cauliflower, I simply put them on a cookie sheet, seasoned with salt and pepper and baked them for about 5 minutes or so at 350*. I just wanted to give them a little bit of something. 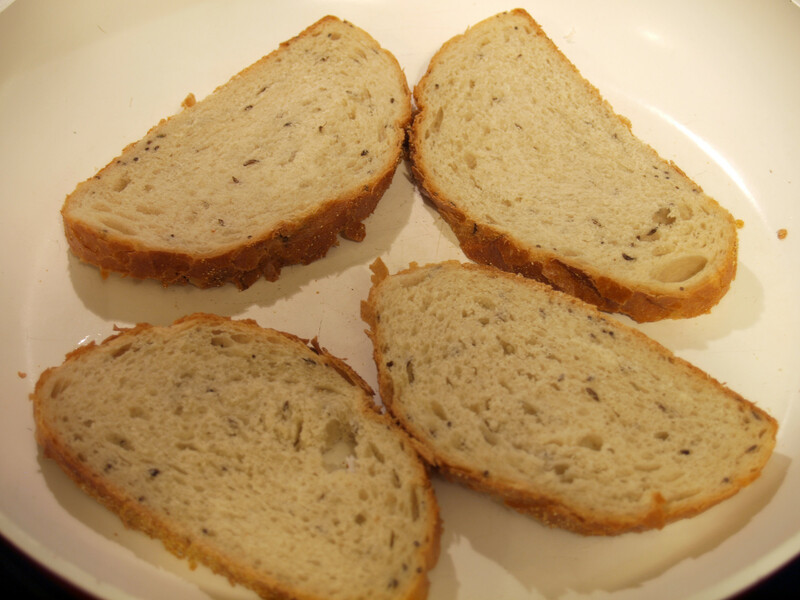 Considering there was a whiteout when I wanted to make this sandwich, I went with what bread we had in the house. It was delicious, fresh rye from the local market so why not? Kick. This grilled cheese had a kick. This grilled cheese really had a kick. My dad tried this grilled cheese and he said he liked it but it had too much of a kick. My mom tried a sample of the cauliflower puree and immediately went for water. I reveled in the heat (although there truly was a lot of it). I either added too much garlic (1 1/2 cloves) or too much fresh chili powder (two nice sized pinches) or too much Sharp Cheddar. 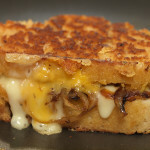 Regardless, this grilled cheese had a kick and it was oh so gloriously delicious. 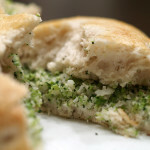 The broccoli may have been unnecessary overall but I do believe it added some texture. If you like heat, make this grilled cheese as hot as you can take it. If you don’t like heat, well then tone down the garlic and exclude the chili powder. 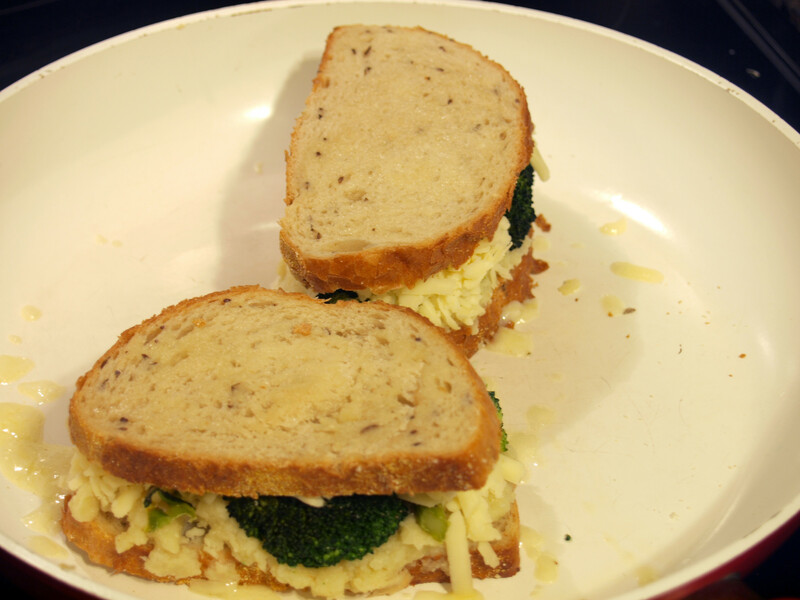 Either way, you will have yourself a delicious grilled cheese sandwich. 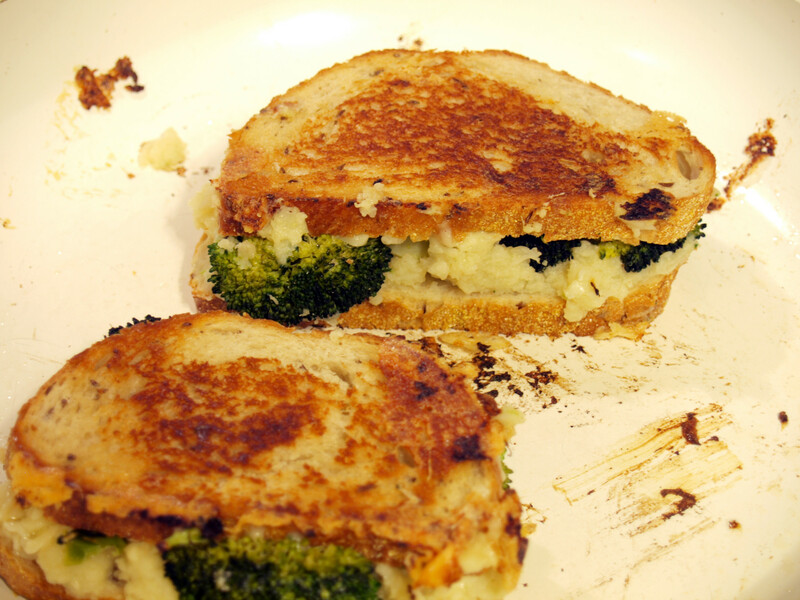 Posted in Grilled Cheese and tagged A, broccoli, cabot, cauliflower, cauliflower puree, chili powder, garlic, rye, sharp cheddar. This is a brilliant idea! We’re so glad you’re on the Cabot Cheese Board.